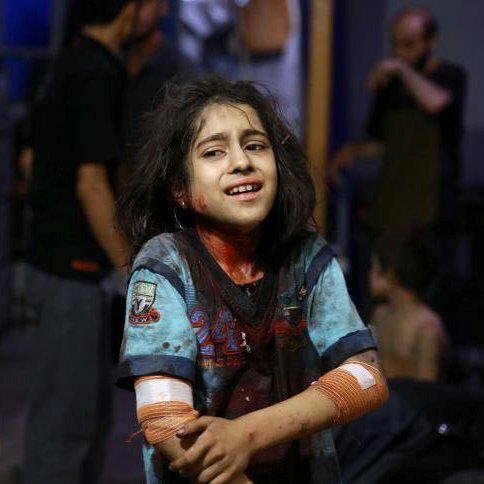 Injured girl, field hospital, Douma, Syria. The downloaded image itself contained no EXIF or IPTC data. Without Putin, Bashar al-Assad as a dynastic leader would have been finished in 2011. However, instead of appropriately responding to Syrian complaints at the time and the yearning for a voice in their own governance, Assad chose to arrest and torture children. All that has changed in the past four years has been the scope in breadth and cruelty of the punishment meted to noncombatant Syrians. At the outset, President Vladimir Putin’s post-Soviet neo-feudal Russia presented a block to the start of the erosion of the Assad family’s absolute ruling power; next: Assad cultivated ISIS by selectively not bombing the al-Qaeda Typicals in their infancy, which then dealt to himself a glorious piece — in his warped eyes — of political theater, “Assad vs The Terrorist”. Putin, Assad, and Khamenei each knew “The Terrorists”, which have largely turned out to be ISIS, although many other and similar organizations exist in the field, would present an even more difficult challenge to the west. For Khamenei, nothing could sustain an Islamic theocratic tyranny in Iran quite like the prospect and reality of a continuous Great Shiite vs Sunni Battle, for which ISIS would conveniently serve as foil to the further expression and regional projection of Iranian Shiite power. For the west, perhaps, there is less of “reset” in what has taken place in Syria and more of pressing the collapse of Soviet-style “state capitalism” in the form of an oligarchy — a “new nobility” — brought into existence and managed by Putin. From that perspective, Russia has stalled in Syria and Crimea — and given the price of oil at the well these days — or the evident callousness of the Russian leadership — it may not want the burden of settling either conflict or reconstructing that which it has helped destroy, both “hot spots” being more effective at bleeding the west of financial resources and focus. With U.S. President Obama shrugging away much of that form of challenge — or seeming to do that — that tack may not be going so well. Similar observations may be made in regard to Iran’s position. Even though it will see immense cash flow for the “nuclear deal”, the regime will have to deal with greater greed around itself as well as its unpopular extension through wars by proxy in the region. Who knows but that Hezbollah will tire of its men dying for the ambitions of the Ayatollah. Still, nothing will change all that fast. While Putin, Assad, and Khamenei together defend “absolute power”, the suffering accompanying that psychology — and what ISIS means to bring to Syrians, i.e., greater tyranny in the name of God, will be even worse — will grow worse: the “Eye Doctor” has lost himself in his own inverted fantasia, a world in which Putin’s Russia has proven “honest, transparent, and principled” (tell that to Ukrainians) and Syrians suffer primarily at the hands of “The Terrorists” and not beneath the barrel bombs dropped on the most helpless of them by Assad’s own air force. The “additional reference” section may be at this point outmoded by a very good and quick Google search engine. We can find what we may want to read in flash; whether we can find the conversation we need to have as quickly remains to be seen.